It’s time to share my ultimate lifetime running goal: I am going to run a race in every state. I decided to make this a goal last summer when David and I went to California for the Disneyland Half Marathon and checked off my third state. This goal combines two things I love, traveling and running! Of course, I’m really excited for the trips to places like New York and Hawaii. But I’m equally psyched to find races in those states that David and I wouldn’t normally think of for vacations, like Maine and Idaho and Kentucky. This goal will force us to think outside the box when we make travel plans and to experience places within our own country where we might otherwise never visit. 1. Any race distance counts. 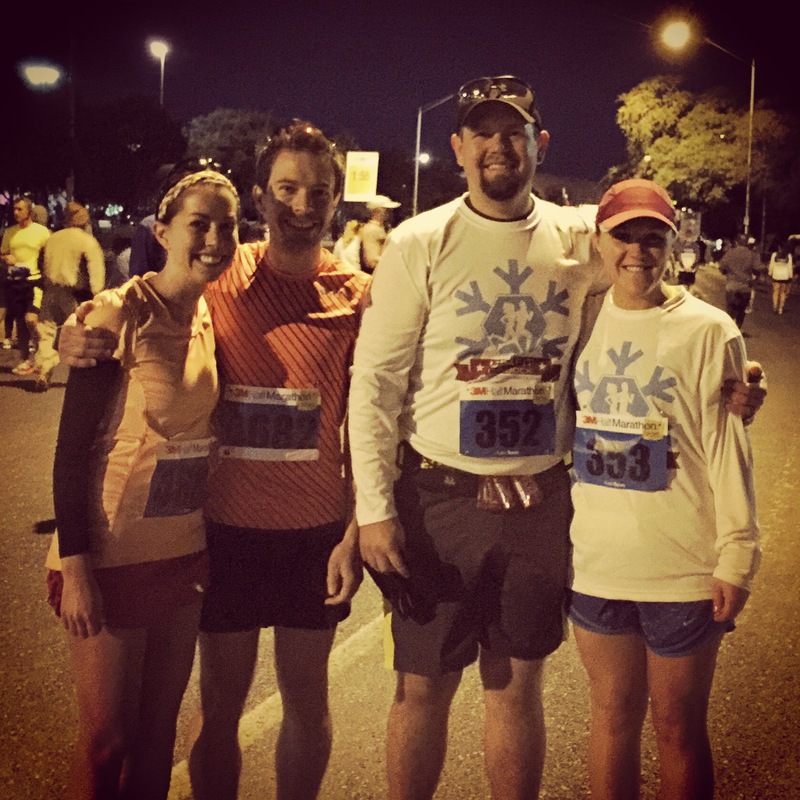 It doesn’t have to be a full or half marathon. If I want to just walk a 5k at a small town festival in Nebraska, that is totally legit. 2. We have to try to really experience the place where we’re visiting, even if we’re only there a couple days. 3. I’m saving Massachusetts for one race only, no matter how long it takes. I’ll be sharing my journey along the way, and hopefully give helpful advice on the best races and things to see in each of the states. I’ve only raced in five states, but hey, that’s already 10% of the way there! This is a goal for life, and I plan to still be running (or jogging, or walking) races for the rest of my life, so there’s no rush to completing it. So far, I’ve checked off Colorado (duh), Florida, California, Illinois, and, most recently, Texas. 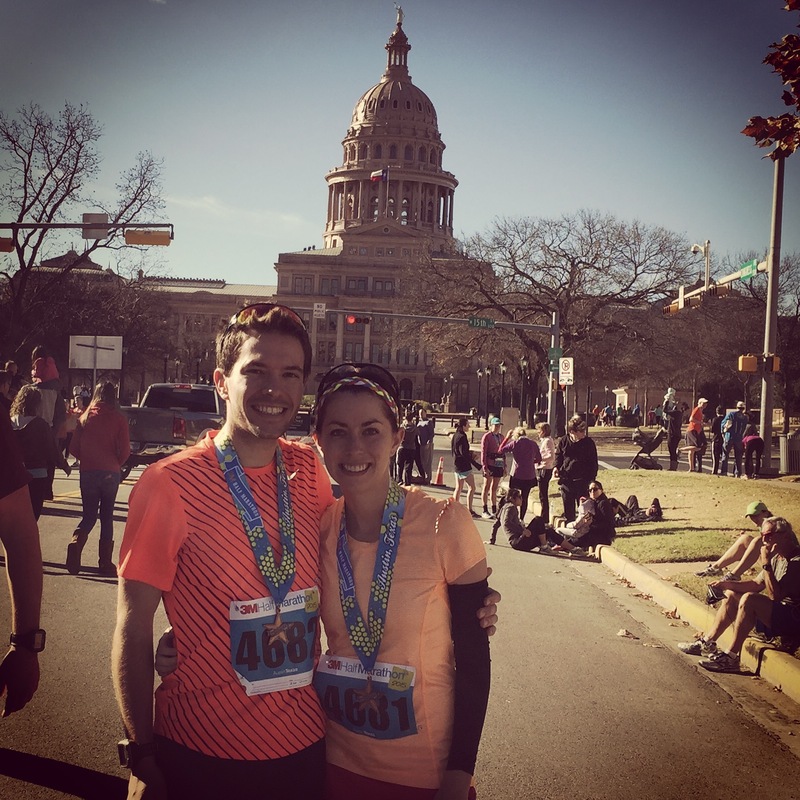 Which brings me to my recap of the 3M Half Marathon in Austin. David and I flew into Austin last Friday, checked into our condo, ate some tacos, and headed downtown to start exploring. 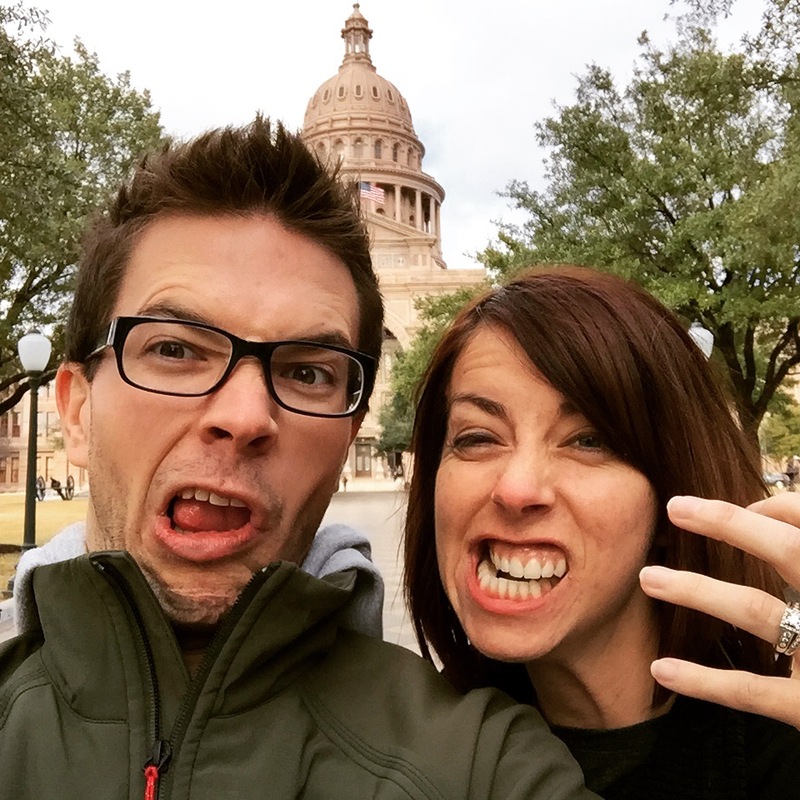 We took a tour of the Capitol and tried to keep it weird, Austin style. Is this weird enough, Austin? We enjoyed some beers at a pub on 6th (the main college drag) to a live musician (which narrows it down to all the bars in Austin). I didn’t have any goals for the race on Sunday, so I didn’t worry too much about what I ate/drank before the race. The race started shortly after we arrived. I ran sans watch, so I have no idea what my splits were like. I stayed mostly with the 1:45 pace group for about the first half, so I guess I was running 8:00 miles. My legs did not feel great. They felt tired almost as soon as we started running. I’m not sure if it was from my less-than-dedicated training the past few months, the fact that I was still breaking in new shoes, or just being tired from the vacation. But regardless, I told myself I’ve run 13 miles many times and I could get through it, so I powered on. I broke away from the pace group at some point in the second half and kicked it up a tiny notch to the finish, for a finish time of 1:44:07. No PR, but it is my second fastest half… behind the Georgetown race in which you lose about a million feet… so I’m happy with my performance. David ran a great race, finishing in 1:29:01 (!) Jordan and Megan ran together. This was Jordan’s second half marathon, and he beat his time by about 10 minutes! It’s safe to say this race was a success for everyone. There were a few food trucks at the finish, but not a huge post race party. The race provided buses back to the start. We got our car and said goodbye to Megan and Jordan. After some much needed showers, David and I went out to brunch (I was so hungry, I thought my body might have started eating itself), then to a brewery/beer garden, where we ended up staying all afternoon and into the evening. The beers were really tasty, and it was a nice day to sit out and people watch (and David and I ended up having a lengthy conversation about math?? You know you’re a nerd when…). We ate pizza while a country band played, and the night was complete with couples two stepping. I really like Austin, although I have to admit, the spectators at BolderBoulder are definitely weirder than anything we saw in Texas. 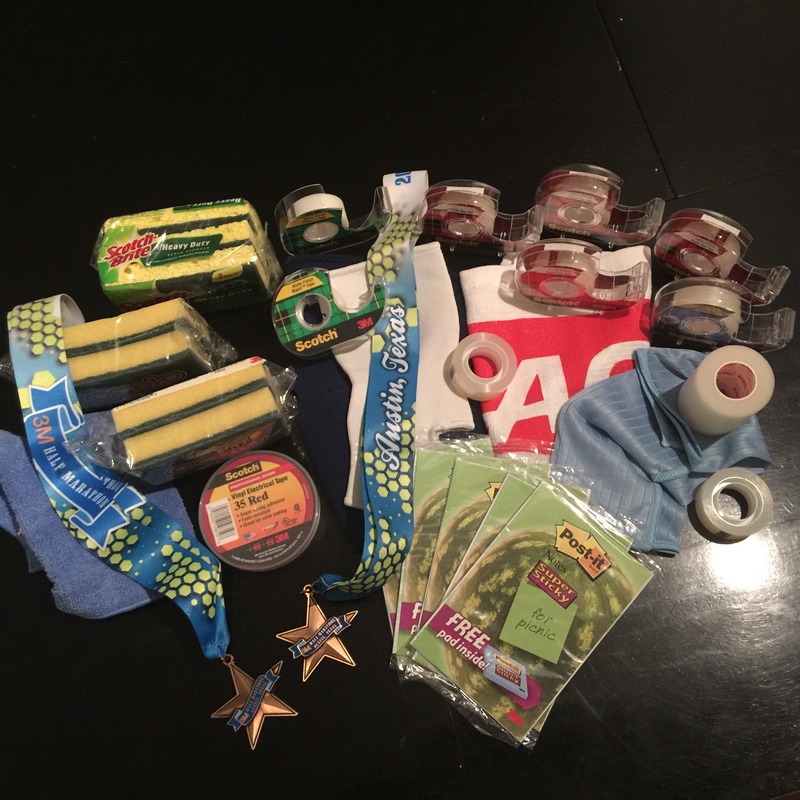 Once we got home, we unloaded our swag, which consisted of… 3M supplies! Woot. Endless tape. We only use tape at Christmas… so this is really going to last us a while. A great race in a great city — I’m glad we picked this one for Texas!